Last week we spent a few good days with a small group of mostly Presbyterian (USA) Christian educators. As I have written before, these are innovative and caring folk, some learned and theologically informed, others who are volunteers and serious about growing in pedagogy and ministry. Young and old, mostly women, these directors of educational ministries in local churches work very hard, often affirmed in ways that tend to minimize their important work. We sell to them a ton of books, from good theology to fun programmatic stuff, from childrens books and Bibles to inspiring memoir and a bit of fiction. We love the Eastern region of APCE, and hope that if you have educators at your church, or at least Sunday school teachers, you thank them often. And, maybe buy them a good book or two, since they usually use their budgets for workbooks and curriculum resources and supplies. Virginia Theological Seminary prof and popular author Joyce Ann Mercer was their main speaker, a woman whose books we stock at the store. Beth nor I had never met her, and although I’ve often wanted to do a blog review since I like her new book a lot. (That my daughter likes the mash-up, re-mix “not a DJ” performing artist GirlTalk makes it that much more fun to talk about.) Now that we’ve heard her and spent some time listening to her describe her research (and yes, selling her a couple of books, too) it seems a perfect time to tell you about three of her titles. And offer you a “blog special” deal, too. Girltalk/GodTalk: Why Faith Matters to Teenage Girls—and Their Parents (Jossey-Bass) $22.95 We generally rave about the Jossy Bass religious line, and this one is no exception. It combines a scholarly acumen with tender heart, good academic and theological foundation with tons of stories, illustrations and narrative. In fact, that is mostly what this is—which makes it worth twice the price for anybody who needs to know this stuff: Mercer spent weeks and weeks interviewing adolescent girls doing “holy listening” and creating a safe space for them to tell of their lives. The girls she interviews are admittedly mostly Christian, although they represent nearly every sort, from Catholic to charismatic, African Methodist Episcopal to United Methodist, Presbyterian to Unitarian. A significant finding of the research, which the narrations show over and over, is that these girls (at least) are willing and able to talk about their faith. Unlike the important work of Christian Smith (whose now-classic Oxford University Press Soul Searching:The Religious and Spiritual Lives of American Teenagers she cites) which found that most youth are unsure and unaware of their religious convictions and inarticulate at that, these girls were often confident and articulate. (This is not to say they were orthodox, or even sensible…) A second fascinating insight that Mercer found was that the subjects—girls she obviously cared for—were able to weave together their own faith and life; God was a given, and their own story (girl-talk) naturally included—no, it naturally was—God-talk. Mercer practices wonderfully the spiritual discipline she preaches—listening attentively, thoughtfully, sympathetically to adolescents—and takes us straight to the heart of the rich complexities of faith as framed through the voices of teenage girls. For all those eager to understand how theology is woven into everyday life, for those ready to serve as advocates for vital faith among teens, this book is an immeasurable resource. 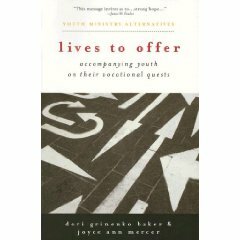 Lives to Offer is a rare book about helping teens think through and embody their own faith journey, especially regarding coming alongside youth as they respond to God by finding callings that matter. There is fabulous stuff in here, interesting and provocative. (And fun! What other books compares Whale Rider and Napoleon Dynamite?) There is a unique chapter about guys (informed by the likes of Raising Cain) another about girls (Reviving Ophelia, natch). There is an closing chapter by “stages of faith development” guru James Fowler regarding vocational discernment and faith development. (And, yes, of course, they cite Sharon Parks, whose Big Questions,Worthy Dreams offers the best research on mentoring young adults.) What a treat to see a semi-scholarly, ecumenically-oriented study of youth ministry. There is an important section in Lives to Offer which is about how being in nature can help young adults. With the adventure/experiential education movement growing, this is a splendidly important chapter; one needn’t agree with the near-pantheism of cited authors Sally McFague or Rosemary Ruether (theological integrity? Yikes!) to agree that this thoughtful chapter is a significant contribution to how we construe youth ministry, and a reminder to be intentional about creation-care, “nature deficit disorder” and helping folks of all ages be open to the voice of God found in the outdoors. I recommend this book for a variety of reasons, but this chapter alone could serve to start good conversations for those doing wilderness trips, church camps and outdoor education. At our recent APCE conference, Joyce spoke passionately and caringly about her convictions not to exclude children (and don’t even get her started about “childrens church”!) She was a delight to listen to–and to read, here–because she has logged so many hours doing the hard professional work of listening to kids. (Think of the way Jonathan Kozel, say, has woven so many good stories and anecdotes of childrens lives in his important work over the years.) This book not only explores the Biblical data and offers theological insight, but it is really grounded in the lives of children and youth. It is based on her extensive research and her hearing and explaining the voices and experiences of children, in church and in the world. I mentioned her passion for children in worship. One chapter in Welcoming Children speaks volumes, and ought to be weighed by pastors, worship leaders and congregational leaders on this very topic: “Practicing Liturgy as a Practice of Justice for Children.” It is rich, thoughtful, deep and radical. In fact, this whole book is rich, thoughtful, deep and radical. It brings together oodles of interesting, vital voices such as social critics bell hooks, Neil Postman, and Zygmunt Bauman, Bible schoars and theologians such as Chad Meyers, Richard Horsely, and Karl Rahner and, educators like Paulo Freire, Henry Giroux, Iris Cully and Carol Lakey Hess. Of course Mercer knows her colleagues and pals in the theology of childhood movement such as Marcia Bunge, Elizabeth Caldwell, or Karen-Marie Yust. A final book or two, not written by Dr. Mercer. We’ve got shelves of books about children’s ministry, about the role of children in our congregations and lives, and a large youth ministry section. Do call us if you want more info. Culture is by Brian J. Mahan, Michael Warren, and David F. White (Cascade; $17.00.) If you are interested in the very ways of Jesus and the social practices intrinsic to Christian discipleship–contra the consumerism and shallowness of our contemporary culture–this call to radical formation and multi-faceted youth work could rock your world. How many youth ministry books quote evangelical youthster Mike Yaconelli and Catholic resister, Dan Berrigan? How many drawer on Charles Taylor, “The Merchants of Cool” and The Prophetic Imagination? Co-author Brian Mahan, by the way, wrote the absolutely wonderful Forgetting Ourselves on Purpose: Vocation and the Ethics of Ambition. Wow. I think that one of my favorite books on understanding the cultural context of kids today is the very, very important book we’ve noted here before: Engaging the Soul of Youth Culture: Bridging Teen Worldviews and Christian Truth by Dr. Walt Mueller (IVP; $1700) Walt is more represenitive of a more historic, orthodox view of Christian doctrine, so that evangelical framework will underscore his sense of vocation, discipleship and the call to nurturing students with life-long commitments to the authority of Scripture and so forth. Yet, I think that even those with more liberal theological biases will find Walt’s work in this book (and at the Center for Parent and Youth Understanding) a very helpful ally for understanding youth, the context for their emerging faith in a postmodern setting. He is, I would say, one of the best cultural critics working in youth ministry today, and his clarifying insight is extraordinary. Is cultural discernment a spiritual gift? If so, he is gifted as he and his CPYU team helps nurture in women and men who do youth work a sense of being “sons and daughters of Issachar” (I Chronicals 12:32) who understand the times and know what God’s people should do. I commend his incisive work in this important book. For a quicker-read compendium of the latest in youth trends and teen culture, see Walt Mueller’s popular Youth Culture 101 (Youth Specialties; $19.99.) It is fairly recent, so it is still up-to-date (although these sorts of books have a short shelf-life these days.) None-the-less, Walt and his CPYU gang have kept their ear to the ground, read widely, gone to movies that teens watch, listen to more hip-hop and alt-rock than most adults ever will, and have a great fun time hanging with kids they love. If Joyce Ann Mercer is the gentle and caring listener, creating space for students to share long narratives of their complex faith lives, Walt is the anthropologist–without the pith helmet— of the cultural context in which those narrations unfold. If you are a parent of a teen, or a youth worker, Christian educator, Sunday school teacher or volunteer youth ministry volunteer, and over 30, you need this book, as the kids might say, so yesterday. Order it today. If you were to choose between Lives to Offer, Awakening, or Engaging, which would you pick?